As I started working on bigger projects, I knew that my vise wasn’t going to be big enough to handle them. What I really wanted was a bending brake, but that wasn’t in the cards. This quick and dirty solution has proven to be very effective and it doubled the capacity of my vise. 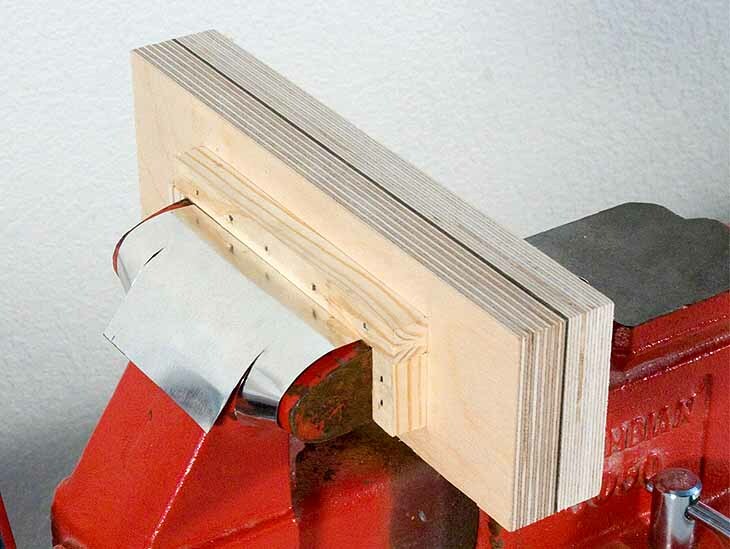 It’s nothing more than a set of large, wooden jaws, with wooden frames to register them on my vise, and some large tinplate tabs to keep them from falling off. I made the jaws from blocks of 3/4″ Baltic birch ply, but you could use just about anything hard—maple, oak, or even MDF. I haven’t specified any sizes here—you’ll need to figure them out based on the size of your vise. Mine is 5″ wide, so I made the new jaws 10″ wide. The jaws are deep enough to be easily clamped in the vise.